This swing thought encourages you to aggressively swing at the ball. This is in contrast to tentatively proceeding with your swing while being overly careful as you progress through. Adopting the attitude that goes alongside hitting it hard promotes an aggressive swing, which leads to more confidence. Provided you are not executing your backswing too swiftly, hitting hard at the ball will definitely lead to acceleration towards impact, helping produce an efficient transfer of energy onto the ball. Golfers who tend to decelerate toward impact would benefit from incorporating this swing thought at the top of the swing as they begin their downswing towards the ball. Otherwise, golfers who sometimes get overwhelmed by too many golf thoughts can resort to simply swinging hard at the ball in order to combat tentativeness. The golf ball will travel furthest only when the hips are involved and uncoil during the downswing. Engraining into your head the thought to hit the ball hard – and thus far – your mind will make sure to get your hips involved which in turn provides a protection against the swing-with-the-shoulders-alone golf swing error. In parallel, simply focusing on hitting the ball will help free your mind of other complex thoughts, which when grouped together can overwhelm a golfer and lead him into inaction in front of the ball. You often see beginners at the range struggling with so many swing thoughts that it takes them a very long time to trigger their swing and actually make a go at the ball. Simply telling yourself to just hit the ball can lead to encouraging results. This swing key can be used for most instances where a full swing is required. 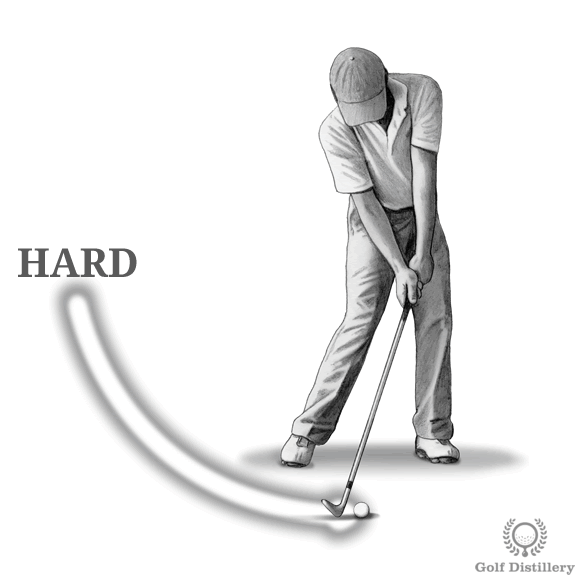 This is in contrast to finesse shots that require delicacy in the movements involved, such as for putting, or chipping. This swing key is directly opposite Don’t try to kill it.